Shares jump on the news that a major insurance company has decided to offer coverage on mobile cardiac telemetry devices. Shares of BioTelemetry (NASDAQ:BEAT), a medical device company focused primarily on mobile cardiac monitoring, are up more than 16% as of 11:45 a.m. EDT on Wednesday. The huge jump is attributable to the news that health insurance giant Anthem (NYSE:ANTM) has decided to offer coverage on real-time remote heart monitors. That's great news for BioTelemetry as Anthem's medical enrollment was just shy of 40 million members as of the end of the second quarter. Thus, this coverage decision should greatly expand the number of patients who could eventually use one of BioTelemetry's mobile cardiac telemetry devices. BioTelemetry is on a roll this year. The company's revenue and profits continue to grow at double-digit rates and it just received Food and Drug Administration approval for its next-generation device called the MCOT Patch. Management believes that the MCOT Patch's lightweight design will make it highly attractive to potential users, which could help to spur growth when it hits the market later this year. 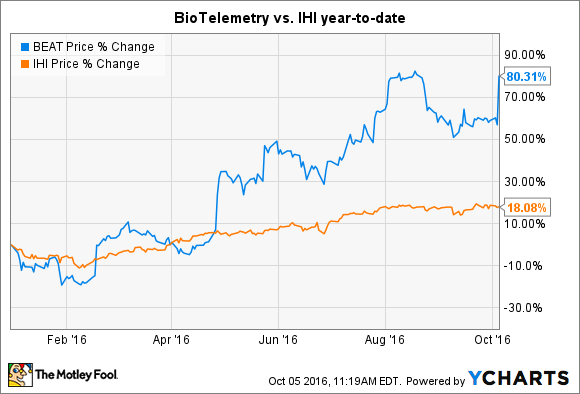 Given all the good news, perhaps it should come as no surprise to see that BioTelemetry's stock has vastly outperformed the iShares U.S. Medical Devices ETF (NYSEMKT: IHI) year to date. All in all, BioTelemetry's future is looking bright. Growth-focused investors might want to consider putting this high-flying stock on their radar.